They don’t do ‘small’ in the United Arab Emirates. The world’s thirteenth richest country builds its own islands and boasts the tallest skyscraper in the world, the Burj Khalifa, which itself is surrounded by enough towering glass-covered skyscrapers to require a fleet of robots to clean them. And now, this country that has risen from poverty to become the world’s thirteenth richest after striking oil, is doing renewable energy in a characteristically big way. 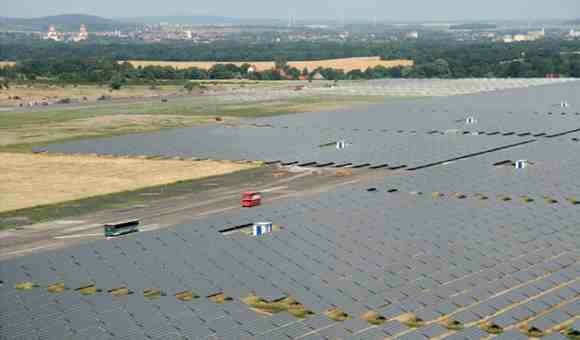 They’ve just completed the world’s largest solar power station. Built by Shams Power Company and named Shams 1, the gargantuan power station utilizes concentrating solar power, rather than the more well known solar voltaic system comprised of photovoltaic cell panels. 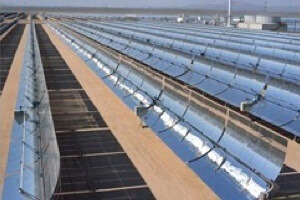 A concentrating solar system differs from photovoltaic systems in that, rather than harnessing direct, they generate electricity from the sun’s heat. The parabolic mirrors concentrate heat onto receivers that contain either synthetic oils or, less commonly, liquid sodium or salt. The heat produced by the receiver is used to generate steam, which is used to drive a turbine that generates electricity. Sham 1 includes 258,048 mirrors that cover about 628,000 square meters. The parabolic mirror design had been proven efficient at the Solar Electric Generating System (SEGS) in California’s Mojave Desert over the past two decades. All together, Sham 1’s parabolic array concentrate heat to produce 100 MW. Compare the Shams 1 to the largest solar photovoltaic system in the United States, the White Sands Missile Range system dedicated at the beginning of this year. Its 10 million kilowatt-hours of electricity per year allow it to provide 10 percent of the total power usage at White Sands, reducing the installation’s carbon emission by 7,400 tons per year. But while it is the largest in the US, at 4.1 MW, White Sands’ output is yet a fraction of what Shams 1 can produce. If you’re going to build a large power array, with lots of sunlight, and flat, empty land, there’s no better place than the desert. The Shams 1 is located about 120 kilometers southwest of UAE’s capital Abu Dhabi. Now incorporated into the existing gas and power grids there, UAE hopes the power array will help bolster economic activity in the western, relatively underdeveloped part of the country. White Sands took about six months to complete and cost the army $16.8 million. Shams 1 took nearly three years to build and cost $600 million. The gargantuan array already has an annual output of 210 gigawatt-hours. In ten years time the country plans on building up its parabolic trough systems to a capacity of 1.5 GW. If it does, the small country could become the world leader in concentrating solar power. At the moment that title belongs to the US who produces about 1 GW of concentrating solar power, followed by Spain at 500MW. But as its name suggests, Shams 1 is just the beginning. Despite its oil-rich land, UAE seems to be making a serious push to go green.